Though Langkawi is composed of some 99 islands (give or take a few depending on the tide), the eponymous Palau Langkawi is far and away the largest island. It has the most popular beach, Pantai Cenang, as well as two huge mountains, Gunung Macinchang and Gunung Raya. 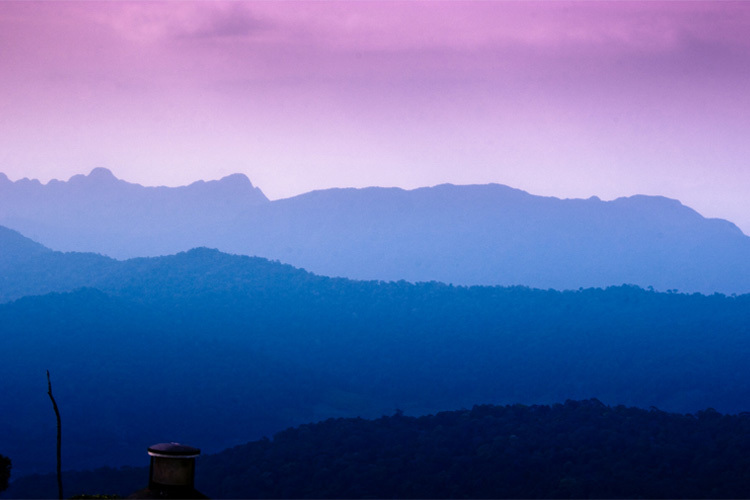 Many ecotourists will wish to trek up these mountains, which takes you past numerous rice fields and through a dense, yet manageable jungle. On top of Gunung Raya, there is a lookout tower that offers a superior view of the islands, though it will cost you about 10 ringgit to enter. There’s also a small road that goes up the top of the mountain, for those less physically inclined. Speaking of trekking through the jungle, this popular activity can take place all over Langkawi. There’s a number of tour agencies, mostly operating around Pantai Cenang, that will take you on a guided tour of the jungle for roughly 150 ringgit, depending on the length of the hike. If you’re cheap, you can do some research to discover these routes on your own, and then hike them independently for free. Although the trails are well marked and maintained, there’s never an entry fee, so you just have to know where to find them. Of course, if you’re really adventurous and want to blaze your own trails, you’ll have no trouble finding a local who will take you to one of the dozens of uninhabited islands. The price of this trip depends heavily on your negotiating skills. Remember not to settle the price or exchange money until you’ve seen the boat you’ll be using firsthand. 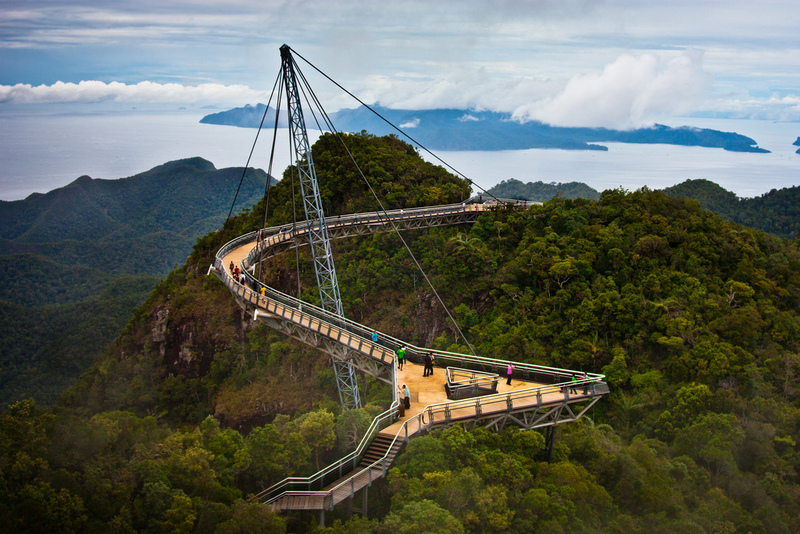 Perhaps the most famous of Langkawi’s on land attractions is the cable car and Skybridge. The cable car takes you 3.5 km up to the top of a hill for a fantastic lookout over Pantai Cenang. From there, you can walk down a rather short trail through the forest to reach the famed Skybridge. 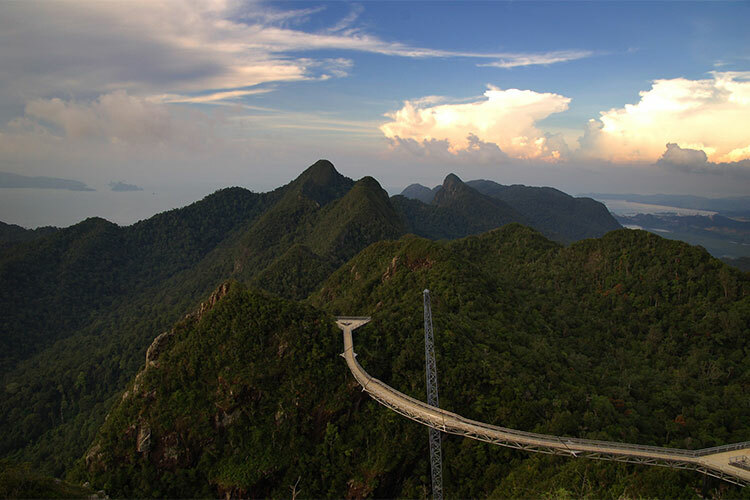 This impressive structure gives you access to the Genting Highlands, one of the most scenic places in Langkawi. 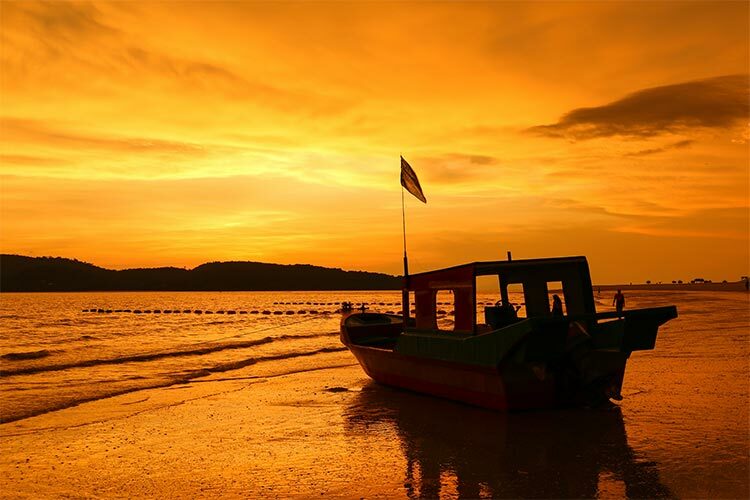 Though Langkawi’s landscapes are quite dramatic and well worth a visit, it is an island group, and that means the main event for most ecotourists is aquatic activities. Unfortunately, much of Langkawi’s waters are a bit cloudy, though some beaches such as Tanjung Rue have somewhat clear water. There are a couple of scuba diving and snorkeling outfits in Langkawi, though be warned: the diving in Langkawi is not nearly as nice as other, similarly priced locations in Malaysia and the rest of Southeast Asia. On a better note, be sure to try the Mangrove River tour. This is by far my favorite activity on Langkawi, ecotourist or otherwise. The Mangrove River tour involves taking a small speedboat down a river, which curls through thick and eerie mangrove forests. The boat stops at various locations, such as an eagle feeding site, bat cave, and a lovely aquatic cave. You might also visit some non-ecotouristy sites, like a monkey feeding area and a fish farm, but this is typical of natural attractions in Malaysia. Just refuse to take part in the activities you don’t feel comfortable with. All in all, however, I’d high recommend the Mangrove River tour. 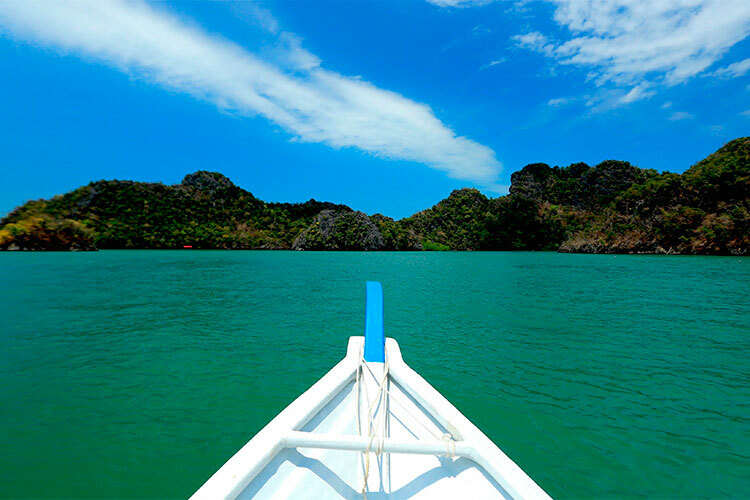 It’s a highly enjoyable way of experiencing one of Langkawi’s most unique areas. Tours can arranged for as cheap as 50 ringgit, though the average price seems to be closer to 100 ringgit. 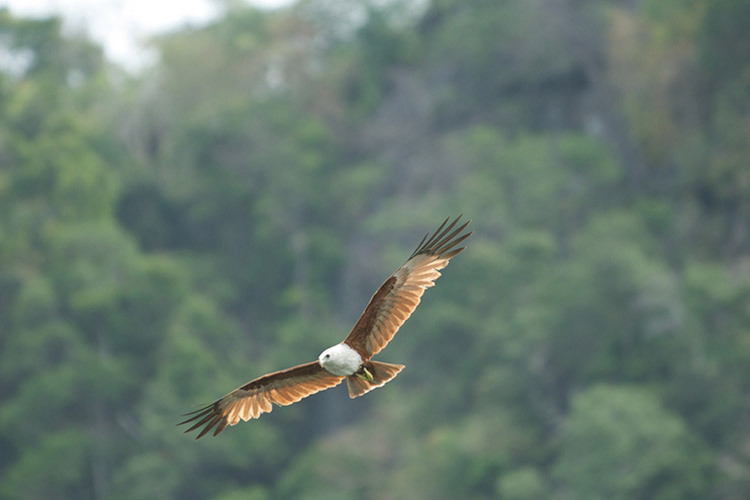 There aren’t too many aerial ecotourist activities in Langkawi (or anywhere, for that matter). However, two particular activities spring to mind. The first and most obvious of these is birdwatching. 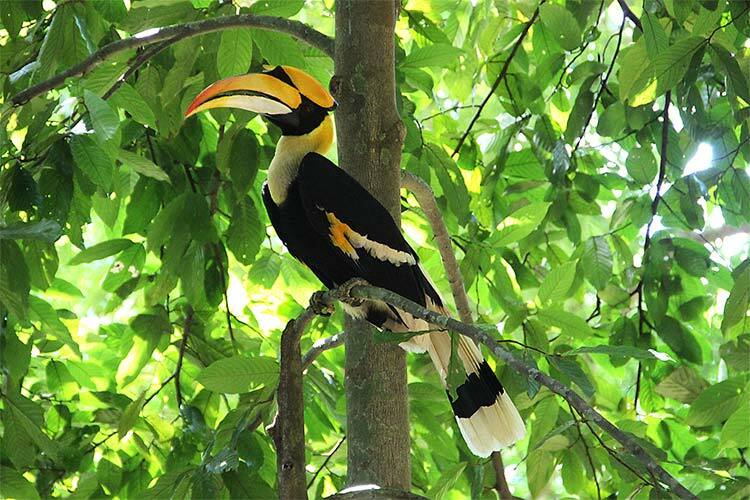 Langkawi is home to other 200 species of birds, many of which are brightly colored tropical species. There’s even a handful of endemic species found on the island. Birdwatching tours can be arranged for 150-200 ringgit per person, which includes the presence of an expert birder. If you already know how to spot tropical species, however, you can always go on one of the free jungle trekking trails around the islands and try to find the birds yourself. The other aerial activity is a helium air balloon ride. This is slightly different than a traditional hot air balloon, but still a great way to see the islands from above. Currently, only one company operates helium balloon rides in Langkawi, SkyTour, which is found in Kuah near the international jetty terminal. Interestingly, SkyTour operates a bar, dance area, and several other amenities in the SkyTour Park, which is where you launch in the helium balloon. Rides are quite cheap, starting at just 30 ringgit. Clearly, there’s lots of ways for ecotourists to enjoy themselves in Langkawi. Although the island doesn’t features tons of nature sanctuaries, there’s lots of well preserved terrestrial and aquatic ecosystems just begging to be explored.